Doll's Musings: Some Wins and Wonderful News! Some Wins and Wonderful News! Thank you all for your lovely and hilarious comments on my last post. The frog jerk did come and visit again and he's no longer a Prince. I shouldn't have encouraged him. I think he's gone now. At least I'm hoping he is!!! Oh boy do I have loads to share with you! First off, I have been uber busy. The reason being is I have landed myself a full time job working as a Learning Assistance Teacher!! WHOOHOOO!!! Luckily, I know the kids and the program but it's a long commute and so my days are long due to hours spent on transit. This means I have very little time for blog reading, commenting, and the most important, stitching. But that's okay! I know you will all understand and still be here! 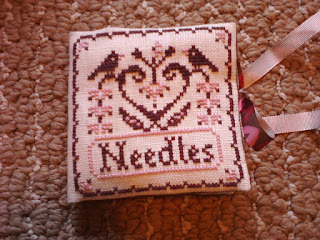 I am trying to pluck away on a couple of projects and am planning to stitch my giveaway item this weekend. Or at least start it! Before I get into the giveaway details I would love to share with you another accomplishment. I finished War and Peace on May 24th!!! It took me 5 months to read on transit. It was a delightful read and I would highly recommend it to any of you who enjoy reading classics. Now that I finished this Goliath of a book, I needed to read a MUCH lighter book so I pulled out a really great mystery by Jo Nesbot called "The Snowman." I haven't put it down since I started it yesterday. A fantastic mystery!!! Some more wonderful news! I have been sooooo lucky and blessed as of late. Truly blessed! 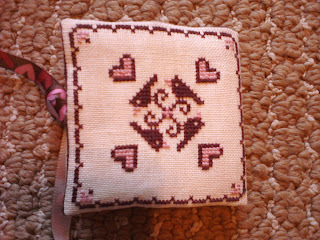 I have been kindly gifted a wonderful biscornu pattern from the ever so generous Carolyn of ....just one more stitch! I mentioned on one of her posts how much I admired Stacy Nash's Quaker biscornu and she offered my the pattern! I can't wait to stitch this one! Thank you so much Carolyn!!!!! Recently I won Topcho's giveaway and on Friday received the package all the way from Bulgaria!! It was so neat to receive a package from there and I could even read some of the Russian on the packaging!! When I opened up the package, I was amazed at what the lovely Nina included in her giveaway. 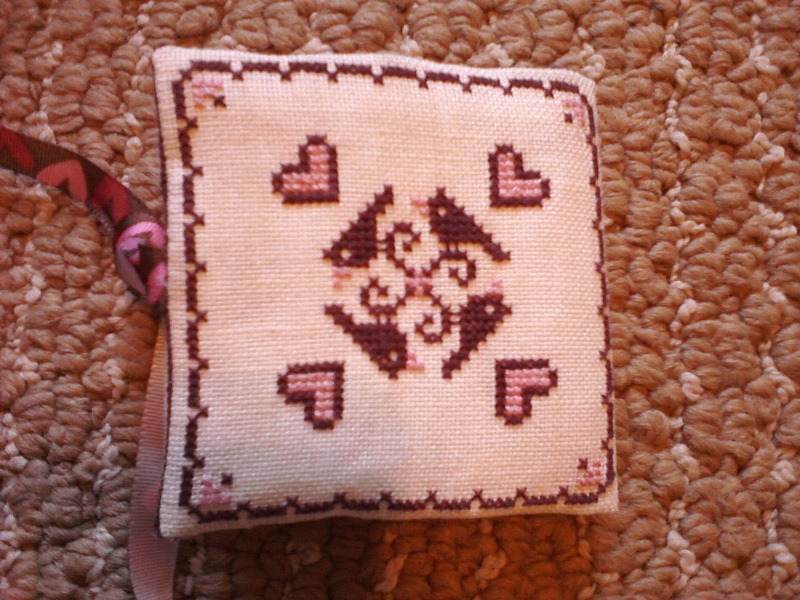 Not only did she stitch the most darling needlebook, my first one!, she also included some lovely fabrics, pins, threads, aida, and wonderful rose products form Bulgaria. She says that Bulgaria is famous for it's yogurt and roses and that she couldn't send some yogurt, so she sent me roses!! Thank you again Nina for your most lovely package! Okay, maybe grab some tea or coffee. This a wee bit long of a post! Sorry!!! No time to do this in chunks! So just last night, I decided to quickly check my blog roll and noticed that I won another giveaway!!! WOW!!! This time from Emma of Evening Emma. It's a lovely book of designs and some fabby and one of Nina's Threads! I'm quite excited to try out the famous threads of Nina!! Thank you Emma!! More good stuff to share. On Friday, one of my girlfriend's invited me out to a Member's Only opening of the Cone Sisters of Baltimore and their collection of the Master's. Um, I don't think I can express in words how excited I was to know that my favourite artist (other than Klimt) was going to be in the exhibition!! HENRI MATISSE!!!!!! I had shivers going up my arms. It was just perfect! I couldn't believe how lucky I was to be there and to be given some insider info from my girlfriend who volunteers at the art gallery and who has a Masters in Art Education. We were giddy looking at Picasso, Cezanne, Van Gogh, Gauguin, Pissaro, Renoir and my Matisse! It was truly an amazing night and I plan to go again with my hubby!!! Oof, I'm so hungry and need to make dinner but I must persevere!! The results of the poll are in and it's a majority for LHN's Bee Pinkeep!!! So that is what I will stitch for the winner! 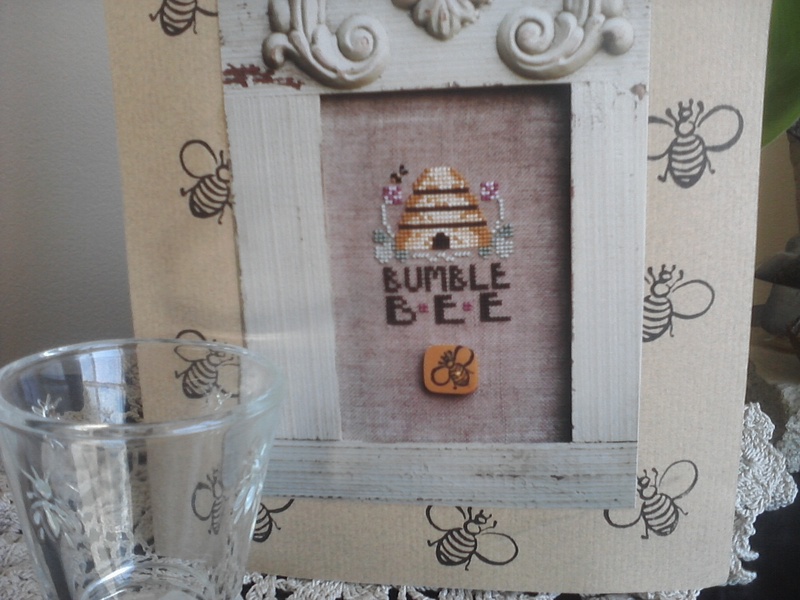 I will also include the lovely Bumblebee chart that I won from Rahenna. I stitched it and loved it and hope to share that love for this darling design! I will also include some other sweet treats too and hopefully, will get a good picture of the giveaway items in the next couple of days or so. Here is the chart so you can have a visual. I was contemplating making this post the giveaway post but I fear it's just far too lengthy and full of other stuff that I will make a separate post. Possibly on Thursday. I just want to give you a little peak into what I have in store for you!! Big hugs and congrats if you made it this far! I'm full of love today and want to send you all some of that love!!! Wow! Sounds like things are really going well for you in all aspects of your life, Anne! Congratulations on your full-time position--I'll bet the kids are thrilled to have you as their teacher :) And what a lucky streak with all the giveaway wins...Enjoy all the goodies! Hope this coming week brings you more smiles, Anne--you deserve them! Congratulations on the job & your recent giveaway wins -you are so blessed! Wow!! You're on a roll!! Congratulations!! Good for you on your blog wins. Enjoy your winnings. Congrats on your new teaching position. Its too bad your job is not closer to home. Congratulations on the full time job and the giveaway wins - you have won some lovely things. love your blog wins and can't wait to see what you do with your goodies ... and a big pat on the back for war and peace that's one epic read . Phew, I made it to the end Anne and enjoyed reading it all the way through! Congratulations on the job, it sounds as if it was meant just for you, I hope you enjoy it. Your blog wins are gorgeous especially those lovely threads, can't wait to see what you create with them. Congratulations! So much good things have come to you. The job will be great. Enjoy the gifts you got. I love working with nina's threads. I'm looking forward to hear more about your giveaway. Congrats on the new job! 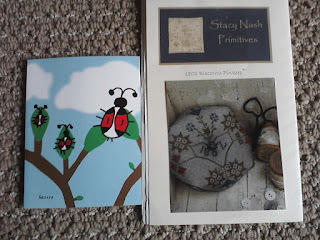 What lovely blog wins and I'll be hoping that that darn frog has definitely hopped away! Great news about your job! I've neber read War and Peace - maybe I should. 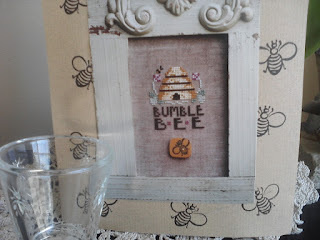 The bumble bee pattern is lovely! What a wonderful post filled with so many good things(except maybe a Titus pic). Congratulations on the job! I hope that your new schedule settles down and you find balance for all your activities. What an accomplishment on finishing War and Peace. 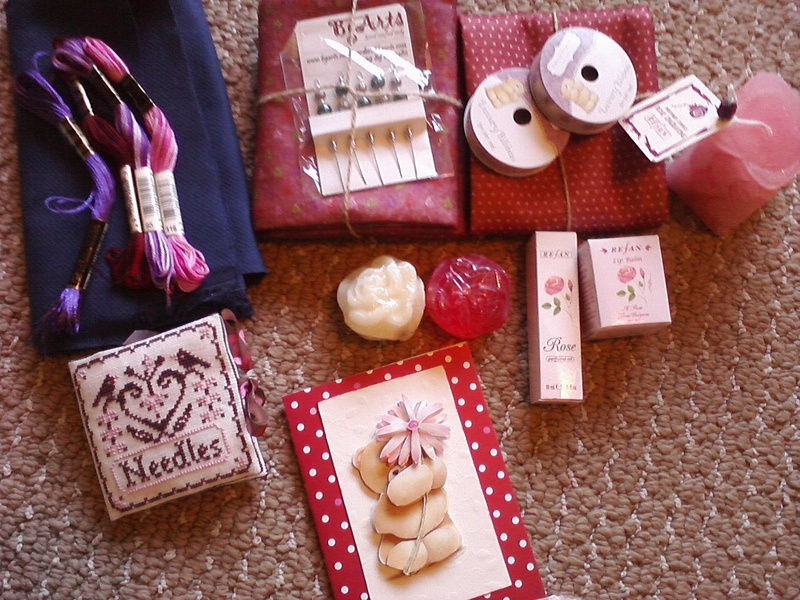 You received some lovely gifts from stitching friends. Congratulations on the new job! I'm so happy for you! Too bad it's a long commute, but sounds like a good post. Bummer about Mr. Frog. Hopefully he'll leave you alone now and you'll also find time to stitch. Love your prizes and wins. So exciting about the members only exhibit too. O, Girl, you sound so psyched! Congratulations on so many things! The big one is the job of course! woo-hooo! Finishing W&P - that's a major accomplishment! I hope for your commute now that you will get a e-reader if you don't already have one! And congrats on all your winnings! Since you are on such a lucky streak, I would suggest buying a lottery ticket? You never know! ;-) Enjoy all the excitement! Congrats on the wins, Anne, that's fantastic! :D And congrats on finishing War and Peace. I've always been intimidated by it - it's such a huge achievement! Wow, the needlebook really threw me off because my GF made the same one in the SAME COLORS! I use it every time I stitch so I almost gave myself whiplash doing a double take when I saw yours, ahaha! Wow, Anne, what an update!! Of course, we all KNEW that you were awesome, so seeing it recognized isn't a surprise. Seriously, I'm glad to hear about the job. That must be so exciting for you. Grats on finishing War and Peace too. Maybe I need to check that out when I can go back to the library. And lovely wins (on the giveaway and biscornu pattern) for you. I can tell how excited you are about both of them. Topcho is another blog that I follow, and she seems to be a real sweetheart. Glad you found her!! And lastly, thanks for the not so sneak peek at your giveaway!! Congratulations on the job! Not too much about the long commute though :( Is it possible for you to stitch in transit too? Lotsa hugs back to you too. Congrats on your new job!! And congrats on your wins too!! You lucky girl! To win several giveaways! Oooh I would of been thrilled to see that master's exhibit! We've got a Van Gogh exhibit here for the next few months and that is a must for me to go see! Congratulations on the job! Matisse is my favorite too - lucky you for seeing his work live and in person! Congrats on the job! Awesome ;0). Congrats on your wins as well - fantastic news all round for you!! You have been doing wonderful! A new job, a great Friday night out, and some fabulous goodies! Lovely pressies - you are very lucky. Can't wait for the Giveaway post so that I can enter! As for the design of the needle book of the small bird, I am stitching now, too. Wonderful chance! Congratulations at getting a full time appointment at the school. How exciting! I'm sure the kids are thrilled too. And good for you for reading War and Peace. It looks like you're on a lucky streak...love the giveaway wins you've received! Congratulations for the new job! Don't worry I'll stick with your blog, I like it so much! Wow! you are just so lucky to have won all those wonderful giveaways! Congratulations!